A Crack in the Denial Machine? Have you ever heard about ocean acidification? I first learned about this problem a few years ago from a marine biologist friend of mine, who told me she was starting to see damage to the shells of some of the smaller organisms she surveys. Since then, of course, I feel like I hear about it all the time. So I was surprised to find out that outside of scientific circles, no one seems to have heard about this dramatic and tangible consequence of rising carbon emissions. What’s the deal with ocean acidification? The ocean acts as a sink for some of the carbon dioxide being pumped into our atmosphere via burning fossil fuels. As people produce more and more carbon dioxide, 24 million tons of it are absorbed by our planet’s oceans each day. The reaction of carbon dioxide with water produces carbonic acid. Since the start of the industrial revolution, our oceans have become about 30% more acidic. This is already leading to ecosystem stress and contributing to the extinction of marine species. Scientists anticipate that acidification will intensify in the coming decades. Shelled organisms, such as clams, scallops, and mussels, are especially vulnerable to acidification. Their shells, made mainly of calcium carbonate, literally dissolve as pH drops. Recently, the Iowa City Science Booster Club put together a suite of activities related to ocean acidification for the Cedar Rapids STEM Fest. We wanted to spread the word about this serious aspect of climate change. Some of us were worried we’d face a negative public reaction, as we have gotten a few negative comments at our other climate change exhibits, and acidification is potentially quite upsetting. But the overall public response we’ve gotten at our climate change events has been so positive, and this material is so important, that we decided to go for it. Ocean acidification is really easy to explore in a hands-on way. We had people breathe into cups of water with straws. This activity was especially popular with kids. Using simple pH strips, everyone could see that the carbon dioxide they were breathing out had a serious effect on the water’s pH. Vigorous bubbling drops the pH from about 7 to between 4 and 5. We also had a bunch of mussel shells. One of our volunteers boldly sacrificed his menu plans for the week in order to eat as many of these tasty creatures as possible before our exhibition. 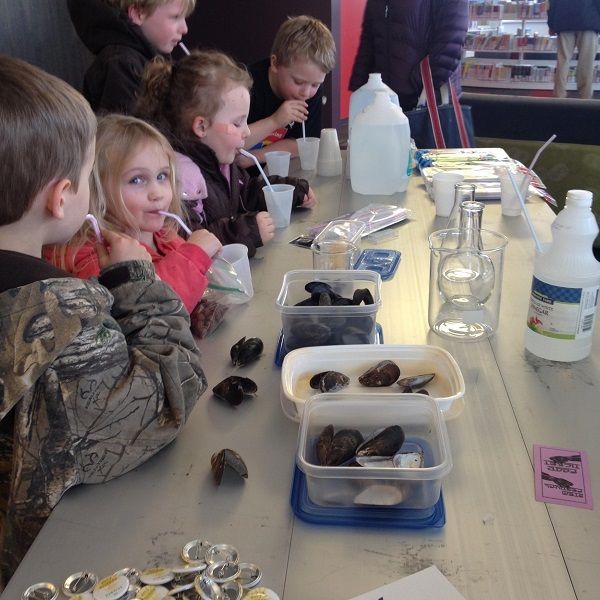 We let kids touch the shells, and we let people put the shells into a clear plastic box filled with vinegar. Everyone could see that the shells began visibly bubbling as they started to dissolve in the acid. How did people react to these rather dystopian displays? They were really interested. We didn’t have any negative pushback. None of the disgust or despair reactions we’ve seen occasionally at our previous events. Some people were skeptical. A couple of people asked if the bubbling shells were really representative: surely, the vinegar had a much lower pH than the acidified water they had just produced. Using the pH strips, we were able to show that the reaction between the vinegar and the shells had in fact lowered the solution’s pH comparable to that of the acidified water. People looked thoughtful. I like it when I find skeptical people. By which I mean people who approach new information with skepticism and rigor, not people whose minds are made up about climate change but call their position “skepticism” about the science. Often, people with a skeptical mindset are curious about science, and they really want to understand the data behind important phenomenon. These same people are, however, often predisposed to accepting misinformation labeled as skepticism by biased media outlets. Untold fortunes have been spent to convince the public that there is a debate regarding the scientific consensus on climate change. But it would appear that ocean acidification is a topic that the denial machine has not bothered to misrepresent. So few people know about it that no one seems to have any serious misconceptions on the subject. This presents us with an interesting opportunity to educate. Using hands on, inexpensive, safe, highly accessible activities, we can allow people to see for themselves what carbon dioxide does to water, making ocean acidification a powerful opportunity to expose skeptical people to the science behind climate change. Plus, you get to make bubbles by blowing into a straw. You get in trouble for that at home! What a cool thing to find through the Science Booster Club Project. I would never have imagined that this exhibit would be so popular, or that literally no one we encountered at this fairly large event would have heard of ocean acidification- not even teachers! This really pushes home the importance of working on the ground, in communities. Not only will the Science Booster Club project help communities grow a pro-science culture, it will help us at NCSE figure out great methods to approach crucial scientific issues in ways that push controversy aside in favor of personally experienced evidence.